You may not know already, but there has been quite a buzz about the internet over the past few days about one small company’s trademarking the words fire cider. 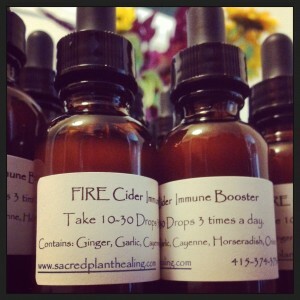 Fire cider is a traditional healing method that has been shared and modified among herbalists for generations. It’s an excellent remedy for colds and flus and is great at boosting immunity when folks around you are sick. 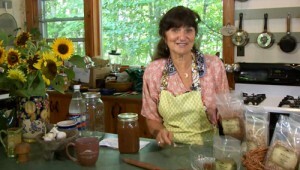 It’s a simple medicine to make and different herbalists have different recipes they use for this traditional remedy. I have my own fire cider that I sell to folks who don’t have the time or the desire to make it themselves. Naturally, I was appalled when I learned that the words “fire cider” have been trademarked. Trademarking the words fire cider is like trademarking the words “lemonade” or “chocolate chip cookies”. This remedy, like so many herbal remedies have been passed from herbalist to herbalist for hundreds of years. A recipe for fire cider was first published by Rosemary Gladstar in the late 70s and she has been sharing this recipe freely and has taught thousands of people how to make fire cider over the past 35 years. It’s no surprise that the herbal world is in an uproar about this. Herbal medicine is at it’s very heart, the people’s medicine. Herbal remedies are grown in the earth and harvested with love. One of the reasons that I am involved with herbal healing is that it is healing that each of us can call forth with our hands and our love of the earth. Anyone can grow medicinal herbs and anyone can make a strong cup of medicinal tea or a healing vinegar. Herbal medicine is about each one of us connecting with the deep healing that is possible when we stick our hands in the dirt and remember that we are a part of beautiful eco-systems that have an abundance of healing to offer. Herbal remedies and recipes are meant to be shared and taught. This is the way people have lived alongside our green-blooded allies for generations. And I believe, that if we as a species are to survive modern industrial civilization, it is a way that must be continued for the generations to come. So it is in this spirit that I am teaming up with one of my favorite herbalists, Riyanna Rebecca Sang on February 2nd to celebrate what has been declared “International Fire Cider Day”. We will be hosting a fire cider making potluck party. We will have fire cider making supplies and will walk you through the process we both use to make our different fire ciders. And there will also be delicious fire cider delicacies to enjoy as we embark on some free fire cider making magic together. Come learn our recipes and in the words of Rosemary Gladstar, “as you start to make it and you add your own little things, it will be your formula”. If you’re upset knowing that this ancient tradition has been trademarked, please take a min to sign this petition asking that this trademark be revoked. In the spirit of celebrating fire cider, I am offering a sale on my fire cider. Can’t make it on to our free workshop on Sunday? Order a bottle for yourself to enjoy at home!